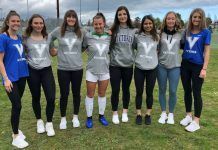 VICTORIA – First-year Vike Kyle Fredrickson made an immediate splash on the world rowing scene this past weekend, earning two gold medals at the 2018 Para Rowing International Regatta in Gavirate, Italy. In what was his first international regatta representing Canada, Fredrickson and teammate Andrew Todd, a 2016 Paralympic bronze medalist, captured their medals in the PR3 M2- events. On Sunday, the graduate of Shawnigan Lake School and his teammate Todd defeated the crew from Great Britian by three seconds to record their second gold medals of the regatta. In total, Canada won three medals in Gavirate. Twenty nations were represented at this event including multiple medalists from the 2016 Paralympic Games and 2017 World Rowing Championships.